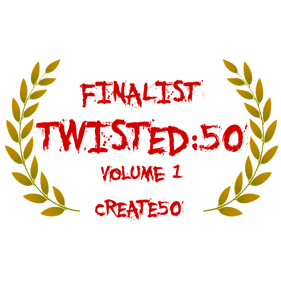 Then Rachael Howard (a screenwriter I’d met online) encouraged me to enter my story about creepy human/spider hybrids into the Twisted50 competition, and I’m so glad I did. It didn’t win a place in the book BUT this rejection was the most important one I have ever had. It was the spark in a chain reaction of events that ultimately kick-started my writing career. With the help of the Create50 writers – for anyone who doesn’t know about this community, visit www.create50.com and check out all the wonderful projects and ways you can get involved – I realised the reason London’s Crawling had been rejected was because I was trying to squeeze a 5000-word story into 2000 words. It was never going to work. After crying into my pudding for a bit, I went about expanding the story. Lucy V Hay (we met online in 2013 when I discovered her advice site Bang2write) took me under her wing and put my name forward for another anthology. London’s Crawling didn’t quite fit the crime/thriller brief but the publisher liked it so much they accepted it, along with a creepy story from Lucy and skin-shivery one from Nick Jackson – a screenwriter I met on the Create50 site. London’s Crawling received rave reviews. I now had the confidence to enter more Create50 competitions. I was also encouraged by the lovely Eileen Wilson who had decided to enter her stories. While waiting for the Twisted winners to be announced, I was asked by the lovely folks at Bloodhound Books if I had written any novels that would fit with their crime/thriller brand. I hadn’t but they asked to see that I had written anyway and decided that my dystopian thriller would fit under their umbrella. I signed a two-book deal. Skeletal was published October 2017, then book two, Avian, was published in September 2018. I was also asked to contribute a dystopian story to The Anthropocene Chronicles, working alongside four other Create50 comp winners: Nick Jackson, Rachael Howard, Carmen Radtke and Fiona Leitch. While all these great projects were happening the Create50 writers asked if I was going to enter The Singularity competition. 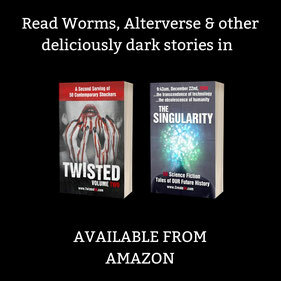 Similar to Twisted, an anthology of fifty sci-fi stories would be published. Alas, I didn’t have any ideas for a short sci-fi story. With three days to go before the competition closing date, I found an outline for a novel in a folder on my laptop. 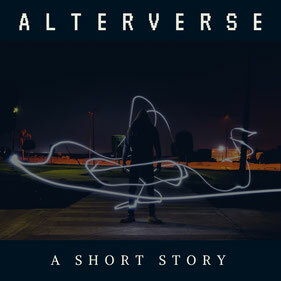 I turned it into a short story called Alterverse, and with helpful feedback from the Create50 writing community, especially Phillip Webb and David Young, who have been huge supporters of my writing career, I managed to create something entertaining. The premise came to me the previous year when I found myself fed-up with life and wondering if it was all some sort of sick game. A few readers compared Alterverse to The Matrix and although not the same story at all, the comparison was a welcome compliment. Unlike Neo, my protagonist is a bit pathetic. He works in an office and then wakes up in a strange place; most of us can relate to that. Where he wakes up is another matter – hooked up to a machine in a futuristic utopia nothing like his reality. 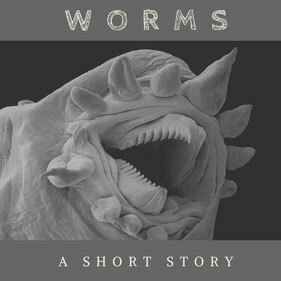 My Twisted50 Vol2 story, Worms, was inspired by a cooking disaster. Though my husband is nothing like the chauvinistic protagonist, Tim, I’m somewhat like Tim’s wife. In the story, Tim’s wife has an issue when ‘cooking’ the family meal. She throws some ruined packet pasta down the bathroom basin (kitchen sink full of dishes) when she messes up the milk to water ratio. This actually happened in real life, except it was my eldest daughter (eleven at the time) who accidently ruined the packet pasta she was about to microwave. Being a busy mum of three, I didn’t have time to fix it, the kitchen sink was full, the bin needed emptying and so naturally I threw the pasta into the basin in the downstairs toilet. My husband came home from work, went into the toilet and shouted, ‘What’s this down the sink?’ I had forgotten to remove the pasta which was now congealed and gross. That’s when the idea for Worms hit me. Readers felt a range of emotions reading about the horrors Tim and his family face. A wriggling nightmare that will make your eyes water. No one can escape the worms! Both Create50 anthologies are such fun reads. Lots of different stories, all of them imaginative and wonderfully different. Why not have a read and maybe even have a write? Let your creativity go wild. You never know, this could be the start of your writing journey and you might not have to suffer five years of rejection like I did because you’re already in the right place surrounded by people who want to help nurture your storytelling talent. 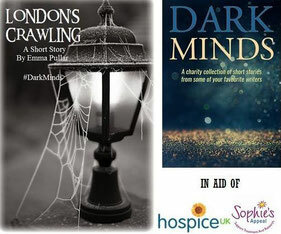 Emma Pullar is a writer of dark fiction and children’s books. She also dabbles in screenwriting and has won/been shortlisted for several short story/script competitions. Find Emma on Insta @Emma_Storyteller or twitter @EmmaStoryteller or lurking in the shadows, spying on people in the name of inspiration and creativity. Brilliant post. I love your work so supporting you was a no brainer.